Happy Father's Day to all the Dad's out there! I saw this general idea a while ago somewhere (I think in book?) and knew that we had to try it! In fact I'm going to do it every year! Won't it be fun to look back to see how the kids have changed? ~ Print the letters D-A-D on 3 sheets of white cardstock using regular Word Processing software. The font is Times New Roman, size 800(! ), bolded and outlined. 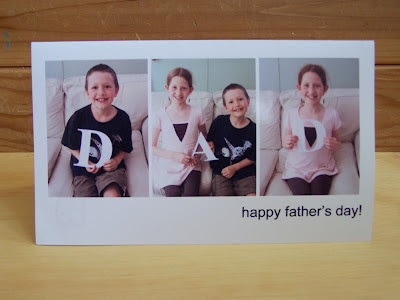 ~ Cut the letters out and "laminate" them (this helps to hold their shape). I used clear Contact Paper sold in the shelf paper aisle at the hardware store. ~ I made the card in my Word Processing software as well. Scroll down to the bottom of the page, insert the photos and type Happy Father's Day underneath. You could totally go to town with fancy software or use printed photos and scrapbook supplies. I thought keeping it simple would keep the focus on the kids. ~ I printed the card onto Staples brochure and flyer paper double sided gloss. (it's reasonably priced and also comes in matte) I use these papers for everything from greeting cards to educational games, science cards, bookmarks, etc. The gloss paper is really nice for cards with photographs. I have seen this idea made into a photo frame as well. I love how creative you can get with the letters. They can be made from any medium - paper, wood, felt, clay, wire, metal, foam, cork, cookies! Or even print the image onto t-shirt transfer paper and make t-shirts for each of the kids! Face painted letters on their cheeks is another possiblity?! Oh my I could go on and on! Please link up your Father's Day cards and gifts, I'm looking for ideas for my Father's Day Pinterest board. This is a great idea for a Father's Day photo, I'll be sharing it on The Crafty Crow soon!